The Youth Resilience Challenge was a parallel resilience youth challenge produced through a partnership between Resilient by Design and the UC Berkeley Center for Cities and Schools that engaged over 800 Bay Area elementary and high school students in climate resilience planning for their own communities. Y-PLAN is an award-winning educational strategy that empowers young people to tackle real-world problems in their communities through project-based civic learning experiences. Elementary and high school students from San Francisco, San Rafael, Richmond, Oakland, and East Palo Alto went on field trips to their local shoreline, designed models and maps showing key assets in their communities, and developed proposals for fostering climate resilience in their own communities. Along the way, students interacted with Resilient by Design Design Team members and key stakeholders. Skyline High School students heard from Dr. Kristina Hill from the All Bay Collective Team to understand groundwater impacts at the San Leandro Bay Estuary site. Laurel Dell Elementary School students helped interview Flood Fair attendees as part of the Bionic Team’s outreach in San Rafael. East Palo Alto Phoenix Academy students led a walking tour for the Field Operations Team to show the team around their shoreline. 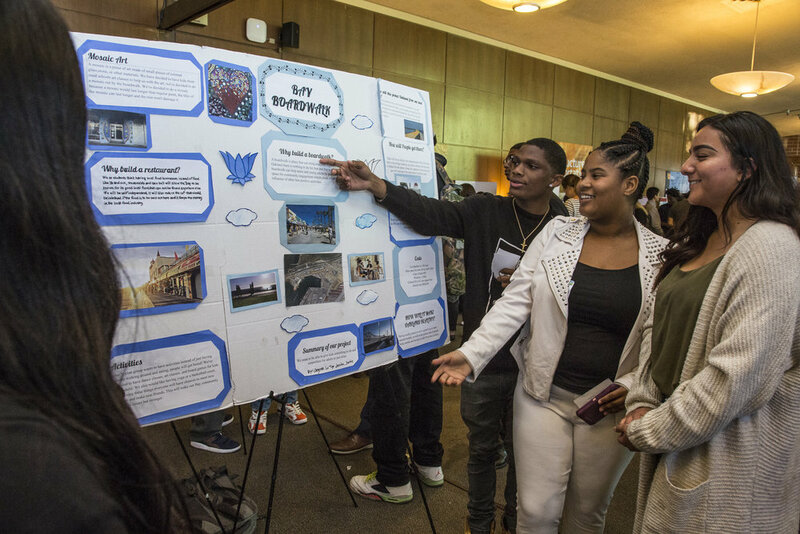 The Youth Challenge culminated in a Regional Summit at UC Berkeley where over 200 students presented their proposals for a climate resilient Bay Area to regional leaders.